I started my academic journey as a zoologist, not knowing that it would lead me to the field of conservation. While doing my Masters in Biodiversity and Conservation, I got to know about numerous wonders of nature- the diverse species of plants, birds, insects, reptiles and a million others invisible to the naked eye. This field gave me immense exposure and exploration opportunities. My most memorable moment would be my Master’s dissertation work on Flying Squirrels (Indian Giant Flying Squirrel) in Gujarat. My dissertation provided me an opportunity to visit two protected areas- Vansda National Park and Shoolpaneshwar Wildlife Sanctuary. My dream of working in a forest came true when I set foot in Vansda National Park, in the Dangs district of Gujarat. On the very first day while travelling with my fellow researchers in a jeep, I encountered a leopard with cubs, a rare sighting indeed! I was enveloped in a feeling of excitement and fear. Yet, I was overjoyed at the sight of this shy and secretive cat. This incident egged me to positively work in the forest. During my field work, I was fascinated by the variety of birds, especially the Racket tailed drongo with its distinctive tail rackets. The Emerald Dove, Rufous Tree Pie, White-throated Kingfisher, Leaf Birds, White-rumped Shama, Sunbirds, Indian Grey Hornbill, Jungle Babbler, Ashy-drongo, Brown-headed barbet, Wagtails and Heart Spotted woodpecker were sighted too. This area is a paradise for bird watchers due to its closeness to the Western Ghats. I used to stay in a forest guest house with trees of Goolar (Ficus racemosa) and Sadad (Termanalia tomentosa) outside my camp for company. As dusk fell, the sound of pebbles hitting the ground made me curious and I observed the tree canopies. I was amazed to spot bats feasting on the fruit and dropping the seeds to the ground. This interaction of the bat and fruit-bearing trees enthused me about the intricate relationships that different organisms shared within an ecosystem. There were days, when the serenity of the nights was interrupted by the sounds of drum beating. I was curious about the origin of these weird sounds and on asking a fellow researcher got to know that it was a tribal form of entertainment in which the tribals assembled around a bonfire and enjoyed singing tribal songs. I got an opportunity to witness this tribal custom at Shoolpaneshwar, where I sat amongst them and enjoyed watching their dance. They were from a community called Vasava. A forest guard further enlightened me about their marriage custom. Singing and dancing plays an important role in the selection of their soul-mates as well as a source of entertainment. It represents their community values and beliefs. I learnt how they were still rooted close to nature and was spellbound! A girl with a mission, I started observing the feeding signs of the flying squirrel. I used to collect fruits, leaves, and bark eaten by the animal as well as its poop samples. 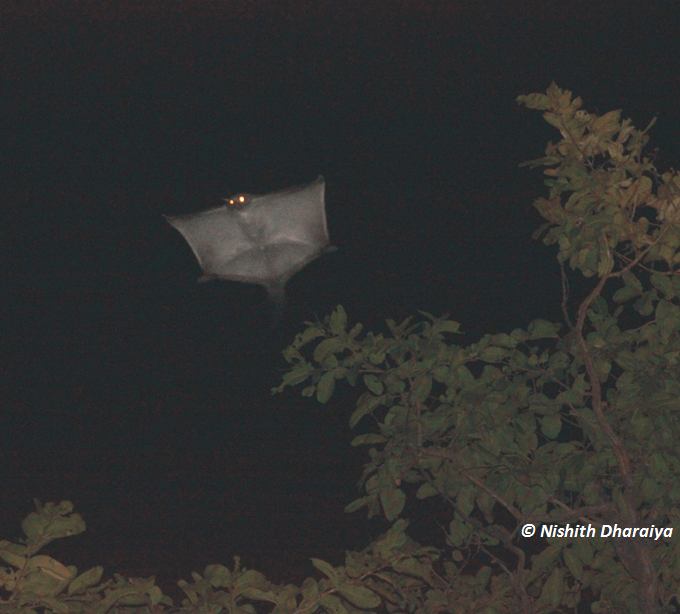 My objective was to observe the gliding behaviour of flying squirrels and I had an urge to watch it in action as soon as possible. A week passed but I couldn’t directly sight the animal. I surveyed most of the forest and the possible locations where its nests were suspected by the forest officials, but my efforts were not rewarded. I started losing hope of encountering it. For recording the gliding activity of the animal it was important to sight the animal. I was worried and contemplating dropping one of the important objectives of my study that was gliding. At this point, my mentor Dr. Nishith Dharaiya came to my rescue and gave me some words of wisdom earned through years of experience. He said, “You have to keep patience. You can’t lose hope so easily. You are working with nature, for that you have to melt in it”. I regained some confidence and kept working towards finding a flying squirrel in its natural habitat and observing its gliding behaviour. I went out on night trails with the hope of encountering the elusive flying squirrel, a nocturnal animal. I was ready for every hardship and in that quest, I spent a night on a watch tower. It was an incredible experience which can’t be expressed in words. That night on a watch tower with tall trees leaning over, I heard the hooting of owls, which unlike popular belief was not spooky at all! Yet, my efforts still went unrewarded: and even after four days of extensive night surveys, I did not get even a glimpse of my study subject. I was highly discouraged and there was a time when I became cynical about its very existence. I moved to Shoolpaneshwar in the Narmada district after 15 days of backbreaking work at Vansda. Shoolpaneshwar is a big sanctuary, divided into five ranges namely Sagai, Piplod, Samoth, Fular and Gora. I covered the area half on foot and half on a vehicle. Though I was trying to be optimistic this time, but the height of the trees was seemingly unsuitable for flying squirrels to glide about. Even the locals and forest officials said that it had not been sighted ever in these ranges. The only place where it could be found was in the Sagai ranges, and so I headed to Sagai. I saw a sign board at the entrance depicting a flying squirrel, this lifted my spirits and I started my work with enthusiasm. 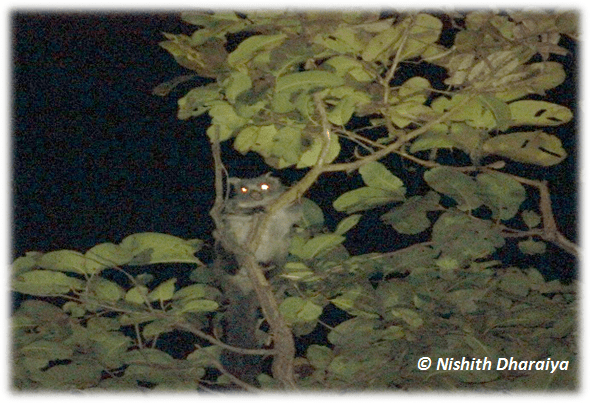 The very first day, I carried out a night survey in the hope of encountering a flying squirrel. Even after days and nights of field surveys, I did not see even a single Flying Squirrel, though the feeding signs were visible. It was not possible to extend my field work and after 10 days in Shoolpaneshwar, I abandoned my quest with heavy heart. While returning we took a halt at Kewadi forest, enroute the connecting forest between Jambughoda sanctuary and Ratanmahal sanctuary. My fellow researcher told me that the chances of sighting a flying squirrel here were high. Reluctantly, I decided to give it one last try and took position under a Mahua tree at 6:30 pm. Eyes scanning the canopy for the elusive animal, we waited. The clock struck 7:30 p.m., and my fellow researcher said “Look, can you see something moving on that tree?” The tree rose some 40 metres above ground, I narrowed my eyes for a better view in the dark. And then it emerged. A robustly sized animal came out of its nest and started hopping from branch to branch. It reached the highest point some 22 metres tall, and took a momentous glide. I was spellbound, this was the moment I was living for! The squirrel landed on the tree and started to feed, its big shiny eyes peering at us tiny specks down below. The sight of the squirrels glide left me mesmerized. The way it spreads its patagium, a thin membrane between forelimbs and hind limbs, left me completely hypnotized. I feel bad about the fact that the Flying Squirrel is among the least known mammals of the world. We cannot deny that most of the attention is being given to the large mammals and hence small mammals are being neglected. I feel that it is high time that lesser known species should be given attention as each and every species plays an irreplaceable role in the ecosystem. My work in Gujarat taught me much working in the forest. I felt an unbreakable bond with nature, an intricate part of it. Over time, this connection grew stronger, the noise of wind and fluttering of leaves were my constant companions. I learned to face fears and challenges head-on instead of backing away. Working in the wild requires a lot of patience, optimism, courage, and determination. The first and foremost lesson is that “Patience is a virtue”. It takes millions of years for a forest to stand up which then gives shelter to a large number of diverse organisms. My experience taught me to be diligent. Being inspired by channels like Animal Planet and Discovery, I always had this urge to face the wilderness. Earlier, the thought of working in the wild used to create a picture of fun and adventure, but this image has now changed completely. I used to think that working in the wild only requires physical strength and it’s all about being adventurous. I now have a different understanding of what it takes to be a wildlifer. It is not just about being physically strong but more importantly, being mentally tough to be able to face the wild, while being a part of it!